The Santa Maria Police Department SWAT team put an end to a multi-hour standoff by firing chemical agents into a domestic violence suspect’s home. Shortly after the chemicals were deployed, the house caught on fire, according to the police department. At 7:37 a.m. Wednesday, officers responded to a domestic violence incident at a house in the 800 block of E. Mariposa Way. When officers arrived at the scene, they found Eddie Dominguez, 29, had barricaded himself inside the home while the other occupants of the house had fled. Concerned that there may be weapons inside the house, officers asked the Santa Maria SWAT team to respond to the scene. The SWAT team contained the home and attempted for several hours to negotiate with Dominguez and call him out of the home. After their attempts failed to draw Dominguez outside, authorities obtained arrest and search warrants. Then, the SWAT team fired the chemical agents into the house to force Dominguez out. Shortly after the chemicals were fired, smoke became visible inside and Dominguez exited the house through a garage door. Police took Dominguez into custody, and Santa Maria firefighters quickly extinguished the blaze. The firefighters had been on scene throughout the standoff. 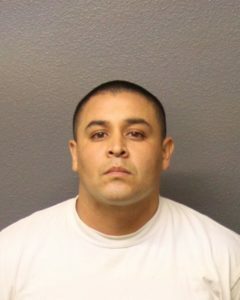 Officers booked Dominguez in Santa Barbara County Jail on charges of kidnapping, stalking, domestic violence, criminal threats, assault with a deadly weapon and obstructing or delaying officers. Dominguez was also charged with having two outstanding misdemeanor warrants. Authorities set his bail at $500,000. Fire officials have yet to confirm the cause of the blaze. The guy is lucky to be alive. If that was CS Tear Gas that the cops deployed into the house, then it could have reacted with the fire to create cyanide gas. Just ask the folks from the Waco Standoff, they’ll tell ya. Oh wait, they’re dead. Maybe…. maybe not. What a goofy headline for this article. How do we know that this lawbreaker did not set his own house on fire? He obviously has trouble making correct decisions.